This newsletter provides a summary of the most recent reports on the damage to Syria’s heritage. It should be stressed that much of this data cannot be verified, but it is hoped that it will assist in the documentation of the damage occurring, and help raise awareness. Heritage for Peace have released a statement concerning their stance on data recording, availbale here. All quiet here: we’re preparing for a number of important forthcoming events, including the UNESCO experts meeting on the protection of Syria’s cultural heritage, the UN meeting on the destruction of cultural heritage and human rights violations, and of course our own SHELTr project. Satellite image of Palmyra. Photo courtesy of ASOR and DigitalGlobe. 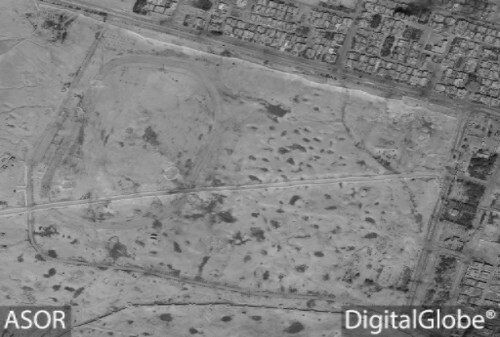 On May 12 ASOR CHI published new satellite photos of the World Heritage site of Palmyra, showing part of the city damaged by the building of a new military base here. See a video here and photos here on Twitter. On May May 18 Russia ‘debunked’ reports of this military base, saying that the camp was only temporary. See more here. Damage to the pillar of St. Simeon. Photo source: The Telegraph. On May 15 Daratezza Media Centre published a video showing the damage to St Simeon’s Basilica (another World Heritage site*) here, and on May 14 here. On May 12 a Twitter user (@markito0171) posted images showing new damage here. On 13 May another Twitter user (@eastchristians) posted a 30 second video here. APSA also reported the same here. The DGAM also reported the information and condemned the destruction here. The Telegraph discusses the damage and its significance here. See also Ross Burns on the damage in the Apollo Magazine on May 20 here. The DG of UNESCO condemned damage to the site on May 17. See more information here. *The site is a key component of the Ancient Villages of Northern Syria world Heritage Site. The Maarat al-Numan mosaic museum appears to have been damaged on May 9. See photo here. On May 18 Association for the Protection of Syrian Archaeology published images showing the damages to Museum of Archaeology in Ma‘arrat al-Numan here and here. On May 17 Association for the Protection of Syrian Archaeology published images showing the damages to Hammam al-Tekyia al-Muradyia in Ma‘arrat al-Numan. These can be found here. On May 24 Association for the Protection of Syrian Archaeology published a video showing the damages to Tell Ajajah archaeological site in Al-Hasakah by ISIS. Watch it here. An updated analysis of the illicit traffic in cultural goods and its counter measures, provided by the ICOM (International Council of Museums) with the contribution of the best academics in the field. Countering Illicit Traffic in Cultural Goods The Global Challenge of Protecting the World’s Heritage, available here. Market of Mass Destruction blog offers a fascinating (if depressing) insight into the sale of (possibly) looted antiquities here, some of which may well be from Syria. The Turkish government responds to claims that artefacts are being smuggled across its borders by translating The Emergency Red List of Syrian Cultural Objects at Risk prepared by ICOM into Turkish and sharing it with appropriate authorities, including customs officials. See more information here. The DGAM and other government agencies participated in a May 6 meeting in Beirut, “Improving inventories of built movable cultural heritage”. For more details, see here. The DGAM and ICONEM continue to document Palmyra using 3D imaging technology. See more information here. 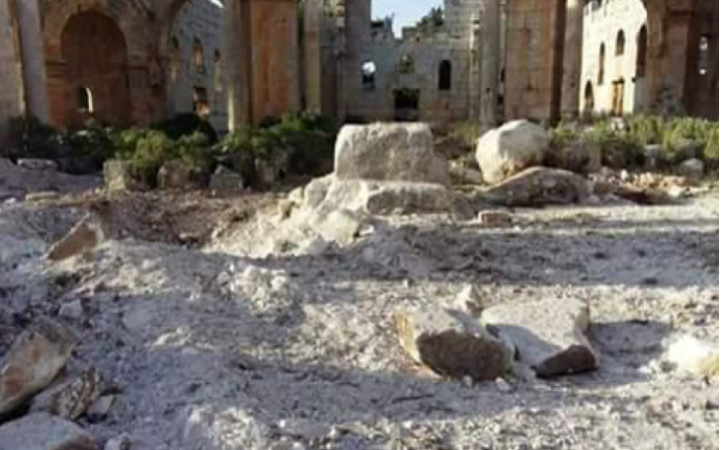 Syria Direct reports on efforts in Idlib and the surrounding area to protect antiquities and cultural heritage. Read the full article here. On April 27 The Organising Committee and Scientific Board of the 10th ICAANE and participants in the conference provided the following statement about the threat to cultural heritage in the Middle East and North Africa. See it here. United Nations Human Rights Office of the High Commissioner calls for contributions to a “consultation on the intentional destruction of cultural heritage as a violation of human rights, in particular cultural rights.” The deadline for contributions is June 10 2016. See here for details. In preparation for the UNESCO experts’ meeting in Berlin (2-4 June 2016) on the safeguarding of cultural heritage in Syria, UNESCO Director General Irina Bokova and UNESCO teams are pursuing consultations with representatives from Member States and experts across the board to assess the situation and the way forward. See here for details. A French team visited the famous castle of Krak des Chevaliers the week of May 23 to offer support to Syrian heritage workers here. The Italian government is offering training courses on the protection of cultural heritage to some of those displaced by fighting in Iraq and Syria, now in Italy as refugees here. In the Queen’s speech on May 18 2016, it was announced that the UK Government will table legislation allowing the UK to ratify the 1954 Hague Convention. See the announcement by the UK National Committee of the Blue Shield here. On May 9 President Obama signed the Protect and Preserve Cultural Property Act into law. See the brief here. See comments on the possible effectiveness of this bill here and from ShareAmerica.gov here, and reaction from Sputnik here. The course will take place in Washington DC, USA from 23rd May to 24th June 2016. Its aim will be the application of interlocking culture and humanitarian specialists strategies during emergency situations. Another purpose is to issue practical skills to protect cultural heritage during emergency situation. In particular this course will report many information about safeguarding cultural heritage after national disasters. Participants will learn first aid measures and damage assessment for sites and collections. They will be prepared to take decisions under pressure, which is very important. Read more here. ASOR CHI’s anonymous crowdsourcing tool Cultural Heritage Monitor is now online, and can be found here, allowing users to submit anonymous reports/photos of damage to cultural heritage. See ASOR’s instructional video in Arabic explaining how to use this tool here. Read a blog writeup of the collaborative project, a bit of description about TerraWatchers, and some discussion of recent results here. ASOR’s Cultural Heritage Initiatives Weekly Report 91/92 (April 27-May 10) is now available here. New photographs show damage to Abu Bakr al-Sidiq Mosque in Dumeir, Rif Dimashq Governorate (ASOR CHI Incident Report SHI 16-0045 UPDATE). Aerial bombardment and clashes between armed groups damaged eight mosques in Aleppo, Aleppo Governorate (ASOR CHI Incident Report SHI 16-0060). An alleged SARG airstrike reportedly damaged the Iman Mosque in Deir ez-Zor, Deir ez-Zor Governorate (ASOR CHI Incident Report SHI 16-0061). Alleged SARG airstrikes damage the Idlib Museum, Al-Jawari Mosque, and Omari Mosque in Idlib, Idlib Governorate (ASOR CHI Incident Report SHI 16-0062). Alleged SARG airstrikes damaged Al-Ma’aara Museum in Ma’arat al-Numan, Idlib Governorate (ASOR CHI Incident Report SHI 16-0063). The Day After Heritage Protection Initiative has produced two reports on the damage and subsequent cleanup of the museum. Alleged SARG airstrike damaged Sheikh Shuayab Mosque in Binnish, Idlib Governorate (ASOR CHI Incident Report SHI 16-0064). New satellite imagery confirms that ISIL militants have leveled several gates of Nineveh in Mosul, Ninawa Governorate (ASOR CHI Incident Report IHI 16-0010 UPDATE). New satellite imagery shows ongoing damage to the site of Nineveh, including the ongoing looting and destruction of the Southwest Palace of Sennacherib in Mosul, Ninawa Governorate (ASOR CHI Incident Report IHI 16-0013). ASOR’s Cultural Heritage Initiatives Weekly Report 89/90 (April 13 – April 26) is now available here. A photograph shows damage to al-Saha Mosque in Palmyra, Homs Governorate (ASOR CHI Incident Report SHI 16-0051). A church converted into a gym by ISIL militants in Shaddadi, Al Hasakah Governorate (ASOR CHI Incident Report SHI 16-0052). A reported SARG airstrike damaged the al-Gharbi Mosque in Tamanaa, Hama Governorate (ASOR CHI Incident Report SHI 16-0053). An alleged SARG airstrike severely damaged the Khaled Bin Al Walid Mosque in al-Eis, Aleppo Governorate (ASOR CHI Incident Report SHI 16-0054). SARG forces reportedly occupy the al-Ghoufran Mosque in Damascus, Damascus Governorate (ASOR CHI Incident Report SHI 16-0055). An alleged SARG airstrike struck an area near al-Firdous Mosque and a car bomb of unknown origin detonated near al-Nur Mosque in Raqqa, Raqqa Governorate (ASOR CHI Incident Report SHI 16-0056). Reported SARG airstrikes damaged Uthman bin Affan Mosque and al-Nur Mosque, severely damaging both mosques in Ter Maalah, Homs Governorate (ASOR CHI Incident Report SHI 16-0057). An electrical fire caused severe damage to Suq Asruniyeh, Suq Meskiyeh, and Othman Bank in Old Damascus, Damascus Governorate (ASOR CHI Incident Report SHI 16-0058). A reported SARG airstrike damaged the Zaid bin Haritha Mosque in Aleppo, Aleppo Governorate on April 22, 2016 (ASOR CHI Incident Report SHI 16-0059). ASOR CHI received confirmation that ISIL militants bulldozed several of the ancient gates of Nineveh in Mosul, Ninawa Governorate in mid-April (ASOR CHI Incident Report IHI 16-0010). The Malthai Rock Reliefs located in Dohuk Governorate were vandalized for a second time (ASOR CHI Incident Report IHI 16-0011). ASOR Cultural Heritage Initiatives releases its weekly report 87/8 (March 30 2016 – April 12 2016) here. New video and photographs emerge of Deir Mar Elian Monastery in al-Qaryatayn emerge after pro-regime forces captured the area (ASOR CHI Incident Report SHI 15-0123 UPDATE). New video footage of Bilal Mosque in the city of Tadmor, showing extensive damage, was recorded on April 5, 2016 (ASOR CHI Incident Report SHI 15-0160 UPDATE). New footage shows ongoing looting at the site of Rafid on April 9, 2016 (ASOR CHI Incident Report SHI 16-0004 UPDATE). Images from the UNESCO World Heritage site of Palmyra and the museum continue to emerge as civilians gain access the site (ASOR CHI Incident Report SHI 16-0041 UPDATE and ASOR CHI Incident Report SHI 16-0043 UPDATE). DigitalGlobe satellite imagery of Palmyra from March 30, 2016 shows many more tombs have been destroyed than previously reported (ASOR CHI Incident Report SHI 16-0044). SARG airstrikes damage four mosques in Rif Dimashq Governorate (ASOR CHI Incident Report SHI 16-0045). The al-Nur Mosque in the city of Raqqa was damaged, reportedly by US-led coalition airstrikes, on April 1, 2016 (ASOR CHI Incident Report SHI 16-0046). Looting and illegal excavations in the Bosra Roman ruins continues (ASOR CHI Incident Report SHI 16-0047). The al-Kabir Mosque in the town of Ma’arat al-Numan, Idlib Governorate was damaged by a car bomb (ASOR CHI Incident Report SHI 16-0048). The Church of the Child Jesus in Tadmor, Homs Governorate was damaged (ASOR CHI Incident Report SHI 16-0049). The Sheikh Saeed Mosque in Saraqib, Idlib Governorate was reportedly damaged by SARG airstrikes (ASOR CHI Incident Report SHI 16-0050). ASOR Cultural Heritage Initiatives released its weekly report 85/6 (March 16 2016 – March 29 2016) here. SARG and Russian forces capture Palmyra from ISIL militants, providing the most comprehensive photographic documentation of the historic site and its museum since the ISIL occupation started in May 2015 (ASOR CHI Incident Report SHI 16-0041, SHI 16-0042, and SHI 16-0043). The Uthman bin Affan Mosque and Bilal ibn Rabia Mosque in Tadmor, Homs Governorate was damaged, reportedly by Russian airstrikes (ASOR CHI Incident Report SHI 16-0039). Two sites in the city of Raqqa, a market near Hattin Cemetery and an area near al-Imam al-Nawawi Mosque, were damaged reportedly by Russian airstrikes (ASOR CHI Incident Report SHI 16-0038). The al-Sayyida Aisha Mosque in the city of Aleppo, Aleppo Governorate was damaged reportedly by Russian airstrikes (ASOR CHI Incident Report SHI 16-0040). Reportedly damage the Al Aisha Mosque in Mosul, Ninawa Governorate reportedly by US-led Coalition airstrikes (ASOR CHI Incident Report IHI 16-0009). A Russian delegation visited Palmyra on May 5, reports the DGAM here. On May 5, renowned Russian conductor Valery Gergiev led a concert in the amphitheatre at Palmyra, with 100 journalists in attendance. See the CNN article here. The Washington Post responded to this event on May 6 here. The Guardian offers further thoughts on 3D technology here. L’Orient Le Jour reports on the talk by Michel Maqdissi at the AUB here. OpenDemocracy examines the destruction of cultural heritage and war crimes in Bosnia, with an eye to current events in Syria here. Al-Monitor discusses the state of Palmyra here. The NYT looks at heritage ‘in the cross hairs’ here. NYT (video) provides an overview of the damage to Syria’s heritage here. Russia’s TASS news agency discusses ‘black archaeology’ here. National Geographic examines looting worldwide, including in Syria here. On May 12 Amr al-Azm gives a radio interview to WYPR here. Sputnik offers the Russian view on calls not to rush the reconstruction of Palmyra, and the attitude of western scholars more generally here. Der Standart (Austria) examines Middle Eastern looting here. OECD Insights discusses corporate responsibility for conflict antiquities here.